Want to know what kind of planner I use? Well, I actually don’t use a planner! 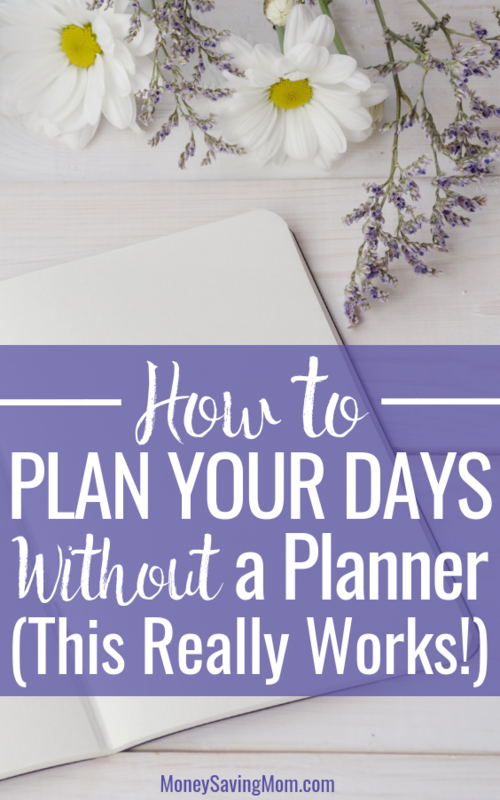 In this post, I share what I do instead of using a planner and how it works for me. I’ve recently gotten a number of questions about how I organize and plan my days, stay on task, and keep track of my yearly goals. I know this will probably come as a shocker to many of you…but I actually don’t use a traditional planner. 1. I “brain dump” everything into Google Calendar. Whenever anything comes up in my mind that I need to remember, I immediately add it to Google Calendar so I don’t forget about it. It might be a doctor’s appointment, a blog post to write, a friend’s birthday I don’t want to forget, a note I need to write to someone, cupcakes I need to take to school for a child’s birthday, etc. This gets the information overload out of my head and into an organized space where I know I can find it when I need it. 2. At the end of the day, I write out a time-blocked To Do list for the next day. I used to do this each night before bed, but this year I’m actually trying to do it as the last work task before I turn off my computer each day. When I make my to-do list, I simply look at my all-day tasks on Google calendar for the following day and then make out a detailed time-blocked schedule. Make it as detailed as possible. This helps me prioritize well and stay on task, especially when it comes to my online work. I don’t want to waste time online and I have to make sure I stay on track, so having a really detailed plan helps me stay on task all day long. Always put the most important things first. Focus on your top priority tasks first to ensure they get done. Life happens and schedules often get thrown off, so you want to make sure you’re prioritizing your most important tasks first. Start and end the day with filling up your soul. I start my day with devotional and Bible reading. And I end my day with reading after spending time with my family. Keep things compartmentalized. I always try to make sure I fully close out my work day so that business isn’t creeping into personal family time. I want to make sure I’m keeping work and personal separate and that I’m doing each thing well when I’m doing it. Wherever I am and whatever I’m focusing on, I want to be all there. 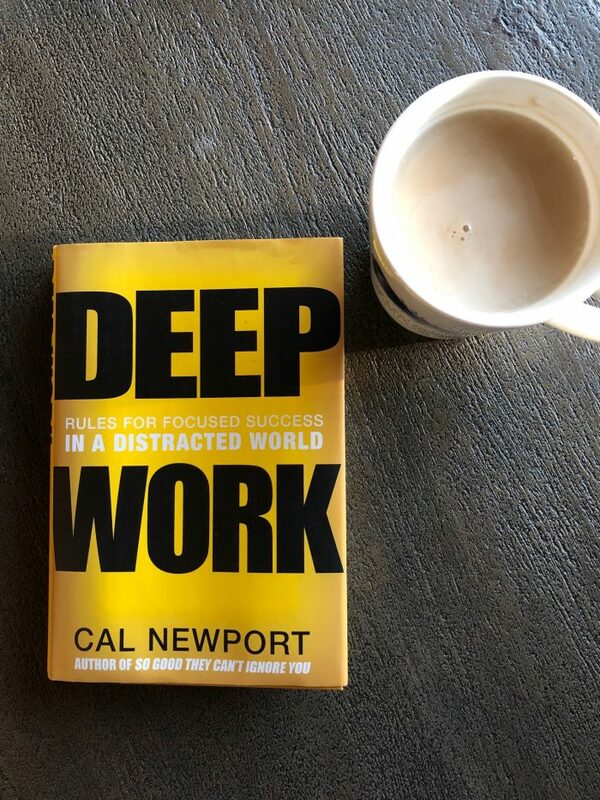 I recently read the book Deep Work, and it really inspired me to find focus in a hurried world and prioritize the compartmentalization of my work and family life. If you’re really good at creating a daily schedule but struggle to focus or get things done, or if you wish you could be more structured in your day, I’d definitely recommend it! 3. I use a weekly habit checklist for my personal and business daily habits. This is a third tool I’ve added this year for 2019, and I’ve absolutely loved it so far! You can see my daily checklist above, and my goal is that there are five checkmarks in every line every week. So I don’t aim for perfection, but I try to do the best I can do while giving myself grace. I also have a separate checklist for work-related habits each day. I try to look at this checklist on a daily basis and track how I am doing. This helps me to have an overall view of how I’m doing in the areas that are a priority to me and helps me to know if I’m getting off track. Want more in-depth details on my planning process? While this post gives you a basic overview, I put together a resource a few years ago that goes more in-depth into how I use Google calendar and how I plan my days using Google calendar and a time-blocked to do list. 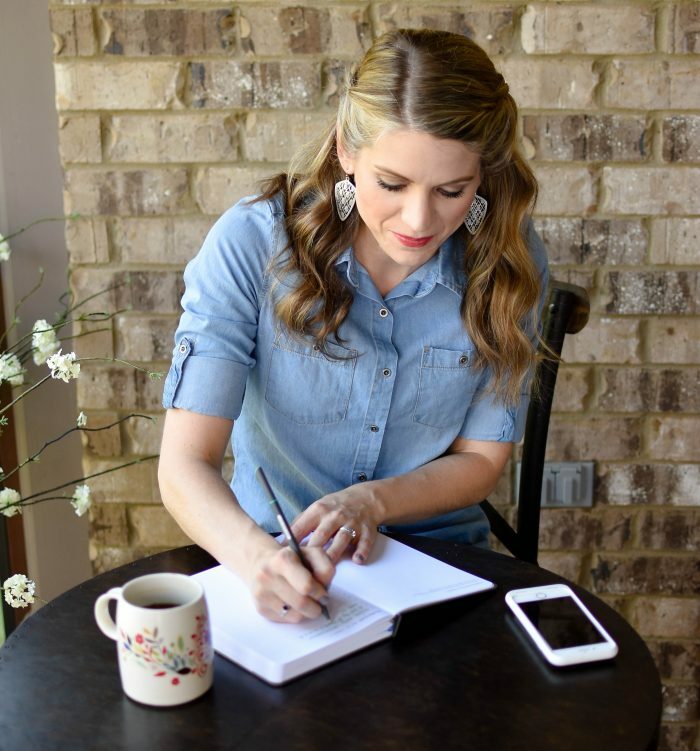 In this free download, I walk you through the nitty gritty details of how I plan out my days, plus I give you on advice on how to implement this system for yourself if you feel like it would be helpful to you! Sign up for my Make Over Your Calendar download for FREE. Before the internet and electronic diaries came, I kept a diary, every year I bought a new medium sized blank page book. I would write down every day Things to do list, same routine at my office job, same at home. It worked for me. At start of new year I would write a large list of major priorities for the year – personal goals, faith, home and finances. Some were achieved, some carried over to the next year. This large To Do list I stuck on my fridge and ticked off any that were completed. Because of the electronic diary I am finding it hard to juggle both systems. I prefer to see things rather than check up my pc or mobile. I even have written reminders where I can see them at the front door when leaving the house, kitchen, in the car I have sticky notes. I’m probably not the most efficient but I use google calendar for appointments and places I need to be because it has alert reminders. I then also write everything in my planner and again on the wall calendar. This way I don’t forget everything. I need to see it in multiple places. I make a daily to do list. I love crossing things off. And I also have a white board on our fridge for reminders of daily things, the kids weekly work schedule and things that need to get eaten out of the fridge. It’s cumbersome but works for us. Thanks so much for sharing what works for you! It sounds like you have a great system in place! Thank you, that is interesting to see. I do some (but not all) of the same. I am curious about your sleep time. I had a vague memory that you increased your sleep hours some time ago, deciding that getting up as early as you were was too much. Did I dream (ha ha, see what I did there) that? If my memory is correct, why did you cut back on your sleep? Are you feeling that much better since changing your diet and eating two salads a day? I struggle because I really seem to need more sleep than “average” and definitely more than your 7 hours (if you fall asleep immediately), so I’m very curious. Ha! You are observant! 🙂 I actually decided to change that to be 10:30 to 6:30 after a few weeks into the year — this was a photo from the beginning of the year! I updated it in my spreadsheet (I need to take a new picture to post!) and that seems to be a better rhythm for me for this season of life. I do really well if I get 7-7.5 hours of sleep. I had hoped to be in bed by 10 p.m. and asleep by 10:30 p.m. every night when I wrote this initial spreadsheet, but I realized that’s not always feasible right now. So I’m shoot from 10:30 to be in bed and (hopefully) asleep no later than 11 p.m. which then means I get a solid 7.5 hours of sleep most nights — which is what I thrive on. I know everyone is different, so please do what works for you and don’t compare yourself to me or anyone else! Thanks 😉 Glad to see you are getting a LITTLE more sleep than I thought you were! Thank you for the kind advice. Yes, I have realized over and over the truth of “To compare is to despair.” We are all individuals with our own needs, stressors, etc. and we have to do the best we can with what we have been given. 😉 And such a good word you shared here! One thing I took away from your blog a long time ago is the importance of scheduling margin time into your day. Nothing ever goes quite like you’d expect, especially with little kids. Margin time was what made me feel like my schedule wasn’t set up for failure for many years. Oh yay! This makes me so happy to hear! Thank you for sharing!